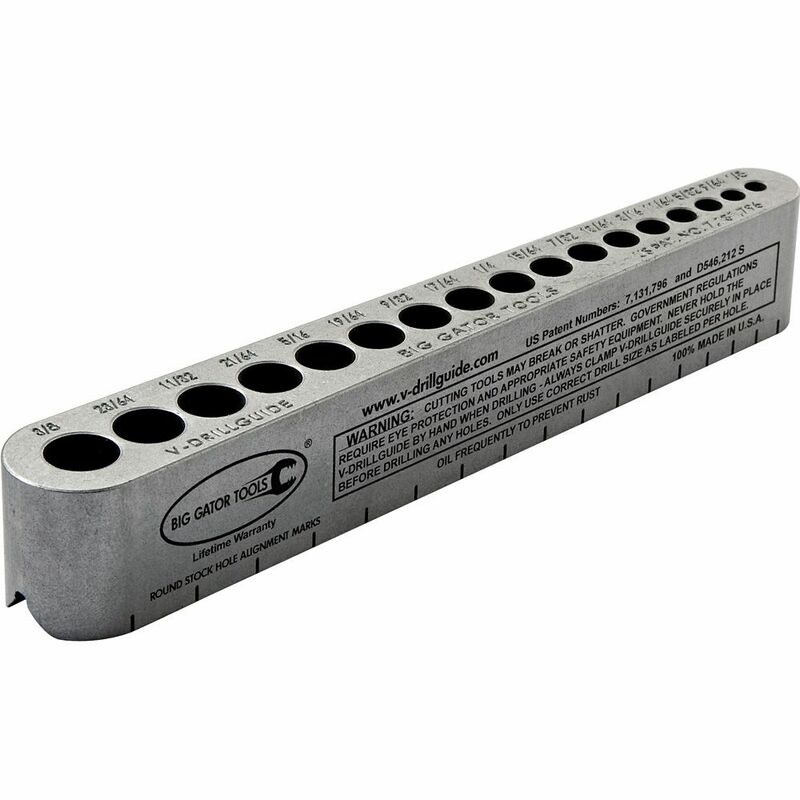 The Big Gator V-Drill Guide is made from special nickel-alloyed steel that is heat treated for durability like drill bushings. The next best thing to having a drill press in your pocket, the Big Gator V-Drill Guide ensures perfectly straight, perpendicular drill holes in round stock, flat stock, and even directly into corners-all with just a hand drill. The precisely milled V-groove in the bottom of the drill guide centers the holes on pipes, dowels, and outside corners, while the flats allow 90° drilling into flat surfaces-just clamp and drill. 17 standard imperial drill sizes match those in a standard 3/8" drill index-everything from 1/8" to 3/8" in 1/64" increments. Also available for metric sizes (#45597, sold separately). THIS is one of the best small tool investments made in a long time! Love how it guides and produces perfect vertical drill holes, even on curved surfaces. This thing is awesome. Little tool that does its job perfectly. I wish I had had this thing for the last 40 years. Very easy to use. Small enough to hold steady in one hand while drilling. This is a very well made drill guide. It allows me to get closer to board edges than I can with Rockler's Stand Up drill guide (which is also very useful). It would have been nice if Rockler carried the next size up from this, covering drill sizes up to 1/2" ( I needed 7/16" at this time). This drill guide works. It is the right height to assure bits stay perpendicular to the workpiece. The guide has markers on the bottom for centering hole position, a nice touch. This is a greatest tool. Let me just say this tool is awesome. You wish I found this tool sooner. I needed to drill a hold in a 3/8 steel rod to insert a 1/8 pin to hold a worm drive gear. Well let me tell you it was perfectly straight. Could not do this with my drill press, bit kept moving even when the flattened the area. as I don't have a drill press, this little aid really helped me drill to right angles. Also, being that small, it added to the flexibility of where I can use it ... at any position any where. Very useful and well made tool. Tight tolerances. I bought this at Rockler (Novi, Mich.) last night and used it to drill new holes in the face of some dresser drawers for new handles, using my hand-held power drill. The drill guide worked like an absolute charm. As to the comment that it's hard to line up your hole under the guide -- not true at all. Just slide the guide up on your drill bit high enough to see the tip of the bit, place the bit where you want it, then drop the guide down onto the wood, hold it in place, and start drilling. I love this thing -- I cannot believe I lacked one for so long. I am sure I'll be pulling this thing out most times I have something to drill. Who doesn't want to drill straight holes? Was needing to drill holes to mount the seats & center thwart in a canoe I had rebuilt. Clamped the guide to the inwales, drilled the holes & wound up with a perfect job. Wonderful tool for short money. Highly recommended. Easy to use and it gets the job done without any guessing. Might have purchased one years ago had I known it was available. This is the cats meow for drilling round stock. Wouldn't be without one. Even if you only drill a hole in round stock occasionally, it's more than worth the price for the ease that it gives you. It's like having a drill press in your tool bag but way smaller. 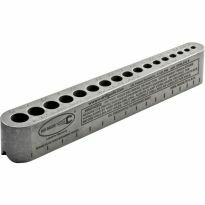 The drill guide is easy to set up and makes drilling accurate straight-in holes a total breeze. It is especially handy on round objects like doweling or tubing. I did the job for me, simple to use, can change positions quickly, was ideal for me. An excellent guide to have if you work in the field or away from a drill press. Elegant in its simplicity. This little thing is built to last. It will get a lot of use. Since I have no drill press, this little guide will help a lot. I'm glad that I found it. A very handy tool when the situation calls for it. Somewhat like having a portable drill press. I love it. This is exactly what I have been looking for. Don't mistake it for a drill press, but it is nearly as good for many functions. I was worried about grinding the sides of drill bits against the walls of the tool, but as long as you take care there is just enough play, and a slick, hard surface. Keep in mind that certain holes on the tool cannot be placed in tight places, inner corners, etc. I achieved perfect doweling on this guy. Works well when you need to drill dowel holes, just clamp the unit to wood and drill. Very simple to use but gives you nice perpendicular holes. I would recommend this to tool at any skill level or shop. Wonderful tool! A must have in any shop. The simplicity in it's design makes it easy and comfortable to use at any ability level. I bought this because my hands were getting less steady with age. After using it once (drilling into an aluminum base plate), I wondered how I went so long without. It's a tool you would never think of until you need a straight drill hole in an otherwise awkward small space. The vee based drill template is a great tool. I use it for both drilling and tappings / threading. Well worth the money for this purchase. It's everything I could hope for and it worked very well for me on the project I purchased for. it's quality that you don't see much anymore. This works great clamps easily to a surface, and holds the drill bit securely making an even hole. 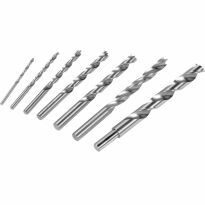 When drilling several holes at one time, the friction of the bit in the hole can cause the guide to heat up quite a bit, but his is not surprising and it cools down fast enough that it does not pose a problem. This is an excellent tool I did not know existed. Their is the obvious use for drilling a variety of hole sizes perpendicular to the pipe, tube, or dowel through the absolute center, without wandering or having to file a flat spot first. It came in handy when I attached it with pan head screws to the ceiling of a clients sales trailer and used a 5 inch drill bit to punch a hole into the aluminum roof 3-1/2" above. The only thing I would add is machined marking lines on opposite ends of tool. It works great.portable and nice for drilling smaller size vertical holes. While I realize the reasoning for the v-drill guide being so narrow, it did make it difficult to stabilize while drilling. I have used it a lot since I bought it and I'm very pleased to have found it. I've always had a hard time trying to keep the drill bit at a 90° angle on both planes. This is a great idea. I can finally drill holes in pipe and rod on center. I love it. Well constructed with great design. I only wish a larger hole size was available. Great tool to help keep you drill straight. Easy to use and helps drill nice straight holes. I'd recommend it to anyone. i finally got it straight as an arrow! I love it! Very well built and easy to use. a thread tap straight . i have been trying to drill matching holes through two pieces of square tubing (one inside the other) with no success. So I googled "drill straight holes", and found this cool device. I believe it will solve the problem. Great tool to get holes started. This tool does the job well. You do need a good clamp to keep it in place. A precision tool. Makes 90 degree alignment possible with out a press or jig. for once a tool was exactly as I understood it to be and it performed exactly as I needed. Don't own a drill press. Our son said he wanted these,, specifically. perpendicular drilling away from the drill press. To have control of more precise drilling of holes. I've needed something like this for years. I pick this vender because of the handy and useful product they have to offer the pro and the beginner. I choose it because I trust Rockler. Another great drill guide to add to the tool box. This is much smaller than a drill press or a drill press attachment. Works pretty well too. 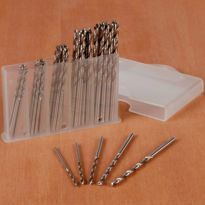 for Hand drilling ease and accuracy! I want to drill holes straight and this guide was my savior! times when I want drill press accuracy but the project isn't amenable to fitting the drill press! I just loved the color, and the rich scent of a new tool. Needed it for a project I was working on. Works great. This will allow me to drill closer to the edges than the upright drill guide which restricts me to about 1.5" from the edges. I don't own a drill press. I hope this jig solves a basic problem with straight drilling. Accuracy of drilling, especially on round stock. Great little portable drill press. Sounds like a handy tool for drilling perpendicular holes with a hand drill. I need metric and inch drill sizes. Reviews indicated that this was an effective and quality product. Handy tool to carry in my drill box. Portable drill guide to insure perpendicular holes. I like it to Drill a quick Straight Hole !!! I tend to run into situations where perpendicular holes are needed but cannot be cut with a drill press. new item wanted to try it. I like many others own a drill press, but there are just places that need straight holes that you can't get to with a drill press. Now I will be able to drill straighter holes, hopefully. Since the V-Drill Guide only has one side with precision marks on it, how do you get a perfect alignment for the hole you need to drill? BEST ANSWER: There are precision marks on both sides of the V-Drill Guide that I have. Not sure I understand your question. But here goes. If you want to line up the hole on the guide with the desired hole you want to make, you could draw a line perpendicular to the position of the guide across your work piece hole long enough to extend past the side of the guide . Then align the marks on the side of the guide with the line that you drew. I marked the spot first and used an awl and put a small pilot hole. I inserted the drill through V-Drill guide held it up until I had the drill bit in the marked hole. Then I lowered the V-Drill Guide and drilled the hole. If you use good quality of brad point bits, you can line the entry point of the bit with a small mark on the workpiece. This will give you a very precise hole. On a video, I saw someone drill a hole at a 45% angle just by turning it over to the other side, but I can't find one advertised that will also drill a hole on a 45? BEST ANSWER: If you're using this guide in attempt to drill a 45 degree angled hole then you may want to consider a different product. This guide in particular is useful for round stock or pipes by utilizing the v-groove on the bottom. One possible option for in a pitch would be to cut a piece of scrap into a 45 degree wedge and then place this guide on top of the wedge with your work piece clamped underneath. Be mindful that you'd need a pretty long drill bit however. I don't completely understand the question, but the Big Gator V-Drill Guide has a length-wise "V" groove on the bottom. This allows it to be centered on round stock like dowels and on corners of square stock. When used on a corner it does result in a 45º angle drilled into the corner. 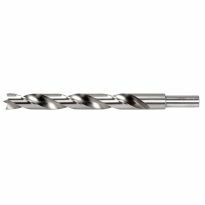 It is otherwise designed to drill only perpendicular (90º) holes. The guide can be positioned on the corner edge of a workpiece to drill a hole at 45 deg from each face. I think this might be the answer. WHAT IS THE SMALLEST DIAMETER HOLE THE TOOL CAN ACCOMMODATE? BEST ANSWER: Hi Dennis. 1/8". I have found the tool useful for drilling bolt holes in the electrical conduit I used to make a frame for the winter cover on my boat. I found that it works best for this task if the tool is clamped in place. As it says on the Rockler catalog page for the guide: "17 standard imperial drill sizes match those in a standard 3/8" drill index-everything from 1/8" to 3/8" in 1/64" increments." I'm looking for a drill guide for a 20mm hole---no can find---? BEST ANSWER: McMaster Carr has a 20mm bushing. You can use it to make one. BEST ANSWER: It is 5 1/2 in. long, 3/4 in. high, and 3/4 in. tapered down to 1/2 in. wide.